One of the best things about the holidays is enjoying the company of the ones you love. Food and treats always play a part in the festivities! This year, try making this recipe for marshmallow dreidel treats to add more fun to the holidays! Your family will be thrilled to see these whimsical holiday treats for Hanukkah. They’re a bit sweet, but these marshmallow dreidel treats are pretty and easy to make (get the kids involved). They’re sure to provide holiday fun for all who gather! Don’t forget to put a batch together to give to friends. Have your supplies handy with the Kisses unwrapped, ready for assembly. Use the tip of a sharp, small kitchen knife to make a slight hole in the top of each marshmallow, then insert one mini pretzel stick per marshmallow, so about one inch is visible. Place the candy melts in a microwavable bowl, and melt them in 15-second increments until smooth. 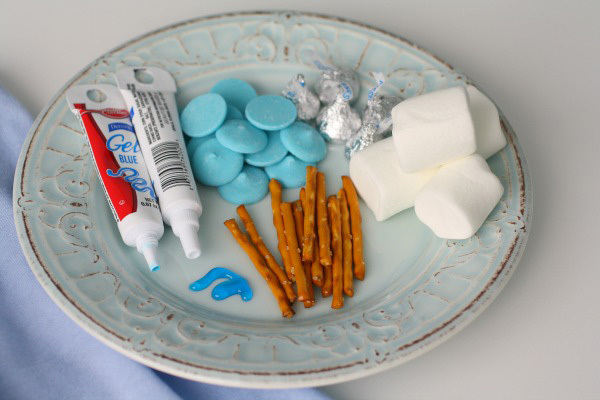 Use your finger to dab a bit of the melted candy onto the bottom of a Kiss as your “glue.” Attach the bottom of the Kiss to the marshmallow bottom (opposite side of the pretzel stick). Dip a clean finger into the melted candy (the candy shouldn’t be hot, just slightly warm), and apply a light coating all over the marshmallow, as smoothly as possible, avoiding the top and bottom of the marshmallow. Hold the marshmallow by the pretzel stick and allow the candy coating to harden before placing it on the lined baking sheet. 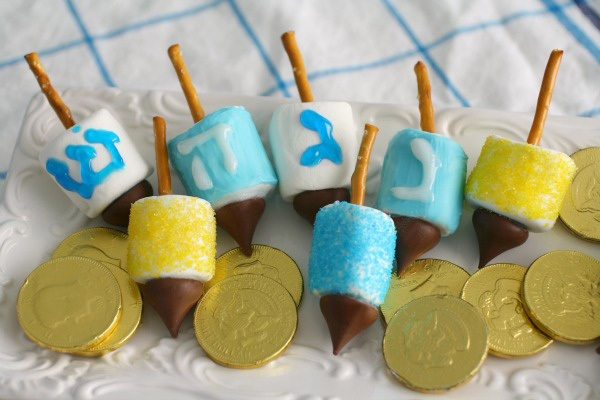 Use the icing to decorate each side of the dried, coated marshmallow with the four Hebrew letters on a dreidel. (Note: gel icing typically doesn’t dry completely, so you may want to use it to decorate just one letter per dreidel). If you’d like to mix in a few contrasting dreidel treats, use sugar sprinkles for your only decoration. Prepare the marshmallow like the others, with the pretzel stick and the Kiss, but instead of coating the marshmallow, simply wet your finger, run it all over the marshmallow, then immediately shake the sugar sprinkles over it.